7 PM, Arts Cafe: Screening of The Molly Maguires, written by Walter Bernstein. Hosted by the 2003 Kelly Writers House Fellows Seminar; all are welcome. Walter Bernstein, one of this year's Fellows, will visit the Writers House on March 17-18, 2003. For information, contact "whfellow@english.upenn.edu". 8:00 PM: "Writers for Peace" Live at the Writers House, a one-hour word and music radio show that tapes at the Kelly Writers House and airs on 88.5 WXPN. Leonard Gontarek is a contributing editor for The American Poetry Review and coordinates The Philadelphia Reading Series. In 2002, he organized The Philadelphia Poetry Festival and (with Alicia Askenase) The Poets For Peace Reading. He has published three books of poetry: a fourth, Irregular Prayer, will be published this summer. His work is forthcoming in Volt and Fence. In addition, he is the superhero LightMan to his son Max. Alicia Askenase is a poet and an editor of 6ix magazine. She is the Director of Literary Programs at the Walt Whitman Cultural Arts Center. Blake Martin is a writer and photographer living in Philadelphia. His recent stories are born from his time as a foster care social worker here in Philadelphia. Kerry Sherin Wright is a writer and Director of the Kelly Writers House. She recently completed her Ph.D. with a dissertation on constructions of masculinity in the work of T.S. Eliot. Lena Sze, originally from Chinatown, New York City, is a recent graduate of Swarthmore College where she won the John Russell Hayes Poetry Prize in 1999 and 2001. She has been published in APA Journal and the NuyorAsian Anthology of Asian American Writings on New York City. Now living in Philadelphia, she is working at the Asian Arts Initiative, a community arts center in Center City. 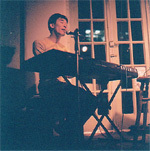 A senior at the University of Pennsylvania, Dan Fishback is a musician and writer from Maryland. Mishael Devlin is a freshman communications major at Drexel University. She writes, "I'm from North Philadelphia. I went to Masterman High School. I hope to work in radio or to be a professional songwriter. I've been playing guitar for about 3 years." 7:15 PM in Room 202: The Penn Review Literary Magazine. The Penn Review Literary Magazine exists to provide the opportunity for publication to all University of Pennsylvania affiliated writers. We invite any interested writers to submit their work, as well as attend our meetings, which cultivate a forum for University of Pennsylvania students to discuss literature and to participate in the creation of a literary magazine. If interested, please contact Stephanie Langin-Hooper, smlangin@sas.upen.edu. 5:30 PM in Room 209: The Songwriting workshop, SOS, Sharing Our Songs meets. For more information, contact Dan Fishback at fishback@sas.upenn.edu. 6:00 PM: Author Jean McGarry will read from her work. This event is cosponsored with Penn's Creative Writing Program. McGarry will be introduced by Max Apple. Jean McGarry has published six books of fiction: Airs of Providence, The Very Rich Hours, The Courage of Girls, Home at Last, Gallagher's Travels, and Dream Date. She's been the recipient of a grant from the National Endowment for the Arts, won a Pushcart Prize, The Southern Review Short Fiction Prize (for Airs of Providence), and published stories in The New Yorker, Yale Review, Southern Review, and Boulevard, among others. She's been on the faculty The Writing Seminars since 1987 and chair since 1997. 5:00-7:00 PM in Room 209: Dissertation Writing Group - For more information, contact Lalitha Vasudevan at lmv@dolphin.upenn.edu. 8:00 PM: Music Speakeasy: Poetry, Prose, and Anything Goes, an open mic performance night. The musical component of tonight's speakeasy will be highlighted. All are welcome! 7:00 PM: Local Spotlight Series featuring Diane Ayres and Harry Groome. Stepen Fried will introduce Ayres and Scott Edward Anderson will introduce Groome. Harry Groome is a Penn graduate (College '63) and holds an MFA in Writing from Vermont College. His stories, poems, essays and articles have appeared in numerous publications and anthologies, including Aethlon, American Writing, Field & Stream, Fine Print, Gray's Sporting Journal and the Red River Review. He is the winner of the 2000 Authors in the Park Short Story Writing Contest, and a finalist for the William Faulkner Short Story Award (1997). Harry has recently finished his first novel, Wing Walking, and a story of his will be featured at the InterAct Theater on March 10th. He lives in Villanova with his wife, Lyn, and their two Labrador retrievers. Art Exhibit for Michelle Ortiz, Surviving the Encounter - Exploring Movement and Contradiction through the Passage of Remembrance, opens. The show will run from February 6th through March 31st. 5:15-7:00 PM in Room 209: Eighteenth-Century Reading Group (Brett Wilson: bwilson@english.upenn.edu). 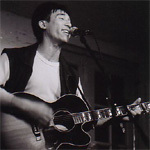 4:00 - 6:00 PM: Boston based singer/songwriter Kevin So will conduct a workshop for the songwriting group S.O.S. (Sharing our Songs). So, an eight-time Boston Music Award nominee, will perform his trademark blend of pop, rhythm and blues, and hip hop, share sources of inspiration, and experiences from the road as a touring musician. He will also share the ups and downs of being an independent singer/songwriter and running his own record label, WingBone Records. An open discussion will take place as well as a brief Q&A. Learn more about So by visiting www.KEVINSO.com. For more information about this event, contact Dan Fishback at fishback@sas.upenn.edu. Listen to an audio recording of part 1 and part 2 of this event. 6:30 PM, Arts Cafe: Screening of two films written by Walter Bernstein, The Front and Fail Safe. Hosted by the 2003 Kelly Writers House Fellows Seminar; all are welcome. Walter Bernstein, one of this year's Fellows, will visit the Writers House on March 17-18, 2003. For information, contact "whfellow@english.upenn.edu". Writers & Artists for Peace will be featuring Leonard Gontarek, Alicia Askenase, Blake Martin, Kerry Sherin, Lena Sze, Nubar Hovsepian and musical guest Mishael Nicole Devlin. 5:00 PM: Poet Steve Benson (pictured at right with Kelly Writers House Program Coordinator Tom Devaney) will read from his work in a program co-sponsored by Penn's Creative Writing Program. Click here to hear an audio recording of the program. Poet Steve Benson challenges the limits of public performance through his experimental, spontaneous verbal improvisations. Benson, associated with the "language writers" of the San Francisco Bay area from 1976-1992, has performed at the University of California, the Poetry Center at San Francisco State, Small Press Distribution, and the Poetry Project in New York City, among other venues. Additionally, he has collaborated in rehearsed and improvised performances with Jean Day, Jackson Mac Low, Carla Harryman, Leslie Scalapino, and others. From 1990-1992 he was a member of the Splatter Quartet, where he used his speaking voice as a fifth instrument. Benson frequently incorporates a variety of media to enhance his stage presentations, including costume changes, props, slides, and tapes. Benson's poems and essays have appeared in anthologies such as The L=A=N=G=U=A=G=E Book, From the Other Side of the Century, and Additional Apparitions, as well as various periodicals. Benson received a B.A. from Yale University, an M.F.A. from the University of California at Irvine, and a Ph.D. from The Wright Institute Graduate School of Psychology in Berkley, California. He has taught at various high schools and universities. For an MP3 recording of this event, and other Steve Benson recordings, see our Steve Benson PennSound page. 7:00 PM: A launch party & reading for Issue #3 of Pom2 with a reception to follow. Hosted by editors Allison Cobb, Jen Coleman, Ethan Fugate, Susan Landers, Betsy Andrews, and Rod Smith. Poets, writers and artists have had a long tradition of providing independent and passionate voices about the great struggles of our time. On February 12, poets all over the country are gathering to speak on and against the impending war--a mass action called Poets Against the War. The poets of Pom2 and the Writers House would like to dedicate Pom2's reading to this larger communal effort. Please join us for this gathering featuring poets who use the imagination as a means of social engagement and change. Susan Landers� book "248 mgs, a panic picnic" is forthcoming. Her recent work has appeared in Magazine Cypress, Combo, and 3rd Bed. She lives in Brooklyn. Jen Coleman, formerly in D.C., now lives in Brooklyn�just like all the other Pom2 editors. Her poems can be seen at www.theeastvillage.com/v12.htm. Allison Cobb is the co-author of Communal Bebop Canto; The Little Box Book; The J Poems; and Polar Bear and Desert Fox. Her first full-length collection, Born Two, is forthcoming in 2003. Work by Ethan Fugate has appeared in Ixnay, The Washington Review, and The Portable Boog Reader. Betsy Andrews is the recipient of a 1999 New York Foundation for the Arts fellowship in non-fiction. Her chapbook, She-Devil, is forthcoming. She is currently working on a novel about the Seven Sutherland Sisters. Rod Smith is the author of In Memory of My Theories, The Boy Poems, Protective Immediacy, New Mannerist Tricycle with Lisa Jarnot and Bill Luoma, The Good House, and Music or Honesty. He edits Aerial magazine and publishes Edge Books in Washington, DC. (Temple University, Dept. of English) Suzanne Gauch's research and teaching interests include postcolonial and gender studies, African film and critical theory. She has published a number of articles on postcolonial Maghrebi literature, French film and the work of Frantz Fanon in literary and cultural studies journals. She is completing a book-length study entitled "Sketches of Fantasia," which analyzes theories of representation as they emerge in the novels of Maghrebi writers. Her current project deals with the trope of the lost manuscript in modernist and postcolonial works of literature and film. In her stories and novels, Algerian writer Assia Djebar recounts the French colonization of Algeria as a progressive vanishing of the female colonized that not even the subsequent struggle for liberation was able to overcome. If colonization objectifies the colonized on the one hand, on the other it establishes the colonizer's language and culture as the sole site of subjectivity. In Algeria, then, the colonizer began to present French language and culture as the means for Algerian women to attain subjectivity by liberating their bodies from the constraints of their "traditional" languages and culture. As she dissects these claims along with those of Algerian nationalists, embodiment - self-consciousness that develops from one's experience of one's body - emerges as the central theme of Djebar's later work, particularly of her celebrated novel _L'amour, la fantasia_. Drawing upon the work of past and present theorists of postcolonialism, feminism and embodiment, Gauch analyzes how Djebar rejects both colonial and postcolonial dichotomies that strip some bodies of subjectivity as Djebar characterizes embodiment not merely as a means of self-liberation, but also a limit to fantasies of self- sufficiency. Djebar's consideration of the dual function of embodiment prompts her to begin formulating a postcolonial feminist ethics based on attentiveness to the other's experience of the body. This event is made possible by the Kelly Writers House, the Program in Comparative Literature and Literary Theory, the Women's Studies Program, and the French Institute for Culture and Technology. 4:30-6:00 PM in Room 202: Mods: Penn Modernism and Twentieth Century Studies Group (Matt Hart: matthart@english.upenn.edu, Damien Keane: dkeane@english.upenn.edu). Matthew Hart, from Penn's English Department, presents "Against the Quiet Way: Hugh MacDiarmid 'After Britain'"
6:15-7:00 PM in Room 209: A meeting of the Writing Advising Steering Committee (Beandrea Davis: btd@sas.upenn.edu). Please note: Room 202 is closed to meetings and programs this evening. 5:30 PM in Room 209: A songwriting workshop, S.O.S. (Sharing our Songs) meets every other week to discuss issues of genre, technique, and craft; and -- most importantly -- listen and learn from fellow songwriters. (Bring your instrument if you have one!) Students, faculty, staff, and community members -- from any genre -- all welcome! For more information, or to join, please contact Dan Fishback at fishback@sas.upenn.edu. 1:00-2:30 PM: Lunch with historian and author David McCullough, cosponsored by the School of Arts and Science. RSVP is required & space is extremely limited. RSVP immediately to wh@writing.upen.edu. This event was cancelled due to snow. David McCullough, arguably America's leading author and historian, will join us for conversation and lunch. McCullough's biography of President Harry S. Truman won the Pulitzer Prize in 1993; his recent biography of founding father John Adams won the same prize in 2002. Additionally, he has twice won the National Book Award and the Francis Parkman Prize. McCullough has lectured in all parts of the country and abroad, including the White House as part of the White House presidential lecture series. He is also one of the few private citizens to be asked to speak before a joint session of Congress. Dr. Sheldon Hackney, Professor of History, will introduce McCullough and moderate an informal Q&A. 8:00 PM: Speakeasy: Poetry, Prose, and Anything Goes, an open mic performance night. All are welcome! 6:30-8:00 PM in Room 209: Lacan Study Group, email lamasc@sas.upenn.edu for info. 6 PM - 7:30 PM in Room 202: Seminar on J.M. Coetzee's Disgrace and a screening of the documentary J.M. Coetzee: Passages, dir. Henion Han. Ewa Ziarek is Associate Professor of English at the University of Notre Dame. She received her Ph.D. in English at SUNY Buffalo in 1989 and has taught at Notre Dame since that year. This talk develops further the main idea of a feminist ethics and its role in democratic politics presented in Ziarek's recently published book, Ethics of Dissensus: Postmodernity, Feminism, and the Politics of Radical Democracy (Stanford 2001). The talk is composed of two parts: By engaging a number of critics ranging from Foucault, Laclau and Mouffe, to Fanon, the first part focuses on the double notion of antagonism--understood either as a formative role of power or as a rupture of symbolic determinations--and analyzes its role not only in hegemonic coalitions but also in the materialization of sexed and racialized bodies. Focused primarily on Levinas and Irigaray, the second part of the paper undertakes a difficult negotiation between the rupture of the antagonism and the anarchic character of ethical obligation and foregrounds the important role of sexual difference in this negotiation. 6:00 to 7:30 PM: Art Gallery Reception for Michelle Ortiz. The exhibit, SURVIVING THE ENCOUNTER: Exploring Movement and Contradiction through the Passage of Remembrance, is curated by Peter Schwarz. Michelle Angela Ortiz, a graduate of Moore College of Art & Design, explores the Latin American and Caribbean cultures and their relationship to a North American locale. Creating works in various media, Ortiz probes issues of otherness, misplacement and uncertainty about identity that continue to perform a significant role in a North American discourse, in a discourse connecting with more globalized perspectives. For the past five years Ortiz has worked with non-profit organizations Taller Puertorriqueno, Network Arts, Mural Arts Program, Congreso, Art for Change, and AMLA. Ortiz has also created over fifteen large-scale murals and mosaics in Philadelphia, Camden and Ecuador. Previous exhibition venues include The Painted Bride, Fox Gallery, Stedman Gallery, Goldey Paley Gallery, and Art Forms Gallery. Ortiz is also serving as the current co-president of the Philadelphia Chapter, Women's Caucus for the Arts. 7:30 PM in 209: A meeting of Reality Writes II, one of three writing groups dedicated to sharing and workshoping Creative Nonfiction. 12:00-1:30 PM: A lunchtime meeting and discussion sponsored by the Fox Leadership Program. Al Filreis spoke to on the topic "The Kelly Writers House: a model for alternative learning." 4:30-6:00 PM: Conversing with Critics: Reviewers Discuss Craft & Career. The event will feature Anthony DeCurtis, Carrie Rickey, Ken Tucker, and Orlando J. Lima and is cosponsored with Career Services. Anthony DeCurtis is a contributing editor at Rolling Stone, and the author of "Rocking My Life Away: Writing About Music and Other Matters." He is also editor of "Present Tense: Rock & Roll and Culture" and coeditor of "The Rolling Stone Illustrated History of Rock & Roll" and "The Rolling Stone Album Guide." He holds a PhD in American literature, and teaches in the creative writing program at the University of Pennsylvania. Carrie Rickey is an international film critic. She received her MFA from University of San Diego in 1976. Her anthologies, movie reviews, features and essays have appeared on numerous publications including The Philadelphia Inquirer, Village Voice, American Film, New York Times, Wall Street Journal, and Mademoiselle. She has also appeared on many televised and radio shows including The Today Show, MSNBC's "The News with Brian Williams" and CNN. Carrie Rickey currently is an adjunct professor at Penn and a film critic at the Philadelphia Inquirer. Ken Tucker is Critic-At-Large for Entertainment Weekly, where he is the magazine's television critic, and also writes about music and books. He was previously at The Philadelphia Inquirer, first as its rock critic and then its TV critic. Before that, he was the music critic for The Los Angeles Herald Examiner. His reviews have also appeared in The New York Times Book Review, the Times' Arts & Leisure section, Rolling Stone, The Village Voice, Esquire, and Vogue. Tucker is also the rock music critic for National Public Radio's "Fresh Air with Terry Gross." He won a 2002 ASCAP-Deems Taylor Award for an essay on country-music star Webb Pierce that appeared in the literary magazine Tin House. Mr. Orlando J. Lima was an English major at the University of Pennsylvania (C '94). After his undergraduate education, he studied at the Teachers College of Columbia University, from which he graduated in 1996. Mr. Lima has extensive 8-year experience working in magazine publishing. He has done work with VIBE Magazine and Seventeen Magazine, working with and focusing on the editorial services of both, most times those that focused on the music industry. During this time, Mr. Lima appeared on various panels on television and radio stations commenting about his views on music, hip hop and popular culture, including popular music stations MTV and VH1. He has also traveled to various Universities lecturing about his views on music, hip hop and popular culture, including the University of Pennsylvania. Along with other works he has published in magazines, Mr. Lima contributed to the New York Times best-seller, Tupac Shakur (Crown). 5:00 PM: The Poet & Painters series presents poet Ron Padgett. Cosponsered with the Graduate School of Fine Arts and the Creative Writing Program. American poet Ron Padgett is a notable translator of French poetry. His translations include Blaise Cendrars' Complete Poems (1992), Pierre Cabanne's Dialogues with Marcel Duchamp (1971), and Guillaume Apollinaire's The Poet Assassinated (1968). For his translations Padgett has received grants and awards from the National Endowment for the Arts, the New York State Council on the Arts, and Columbia University's Translation Center. Most recently, he was appointed Officier dans l'Ordre des Arts et Lettres by the French Ministry of Culture. Padgett is also the author of New & Selected Poems (David R. Godine, 1995), The Big Something (1990), Triangles in the Afternoon (1979), Great Balls of Fire (1969), and other collections. Two new volumes are forthcoming: Poems I Guess I Wrote and You Never Know. Padgett was editor-in-chief of World Poets, a three-volume reference book (Charles Scribner's Sons, 2000). 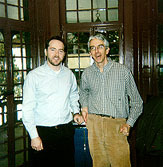 For twenty years Padgett was the publications director of the Teachers & Writers Collaborative. He lives in New York. Bang Goes the Literature is a hand-made book created in collaboration with Bertrand Dorny. Recordings of this event that have been made available as part of the PENNsound project can be found here. 4:30-6:00 PM in Room 202: Mods: Penn Modernism and Twentieth Century Studies Group (Matt Hart: matthart@english.upenn.edu, Damien Keane: dkeane@english.upenn.edu). Laura Winkiel, who teaches English at Iowa State University, presents her paper, titled "The Rhetoric of Violence: Vorticism, Futurism, and the Culture of Attractions".